Los Angeles, CA — Taxpayers of Los Angeles will have to pay for their police department’s misconduct yet again, as a woman who fell out of a squad car in 2013 has been granted a $3.5 million settlement. Kim Nguyen had been arrested for alleged public drunkenness, handcuffed, and put in the back of a Los Angeles Police Department patrol car. At speeds of around 30 mph, Nguyen leaned against one of the back doors — which turned out to be unlocked — in an attempt to escape a sexual assault by one of the officers, according to her lawsuit. “Officers David Shin and Jin Oh arrested Nguyen for public intoxication after they saw her run across the street about 3 a.m. on March 17, 2013. At the time, Nguyen was a graduate student in her last semester at Loyola Marymount University’s MBA program. Nguyen had to undergo “extensive and painful surgeries” — including having her jaw wired shut — for the injuries sustained in the fall, and was hospitalized for 17 days. Nguyen also lost all of her teeth from the impact of the pavement. According to the lawsuit, the officers involved failed to follow several standard procedures — including seatbelting Nguyen properly and securely locking the patrol car’s doors. Although defense attorneys claimed Nguyen had been trying to escape, the lawsuit states the handcuffed woman had merely been huddled against the door — to be as far away from the inappropriate contact of the officer in the back seat as possible — when it swung open, causing her to fall out. 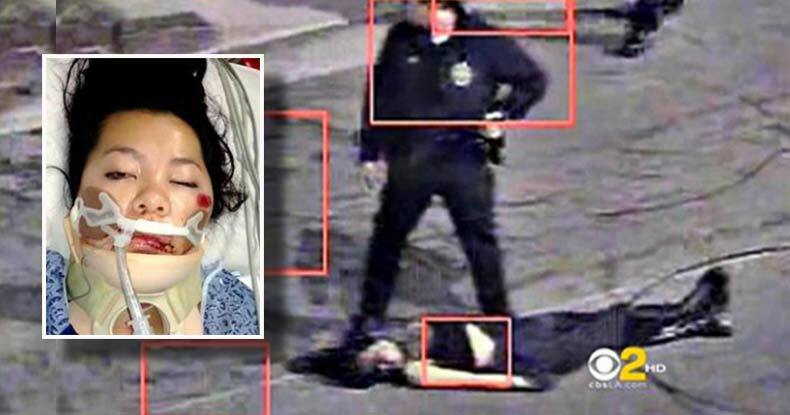 CCTV captured Nguyen falling from the LAPD patrol car, with her dress ‘removed’ from the waist down, lending a great deal of credence to her claims of being groped by the cop. Nguyen will now receive at least the semblance of justice for the ordeal she endured. But, like nearly all settlements and judgments concerning police abuse, misconduct, excessive force, and more, the cops responsible for this gross negligence and sexual assault won’t have to pay a dime — the city’s ‘settlement’ comes straight from the taxpayers. This isn’t some fault of Nguyen’s or of other victims, but until errant police officers and departments are forced to feel the sting of punishment where it really hurts — their wallets — cops have no tangible fear of consequence for bad behavior.